Picture in your head a modern brewer. If the person you imagine is impressively bearded, stocky, tattooed and male — well you’ve got a pretty good sense of an average brewer. But there are some who break the mould, and one of them is Toronto’s Shannon Howatt. 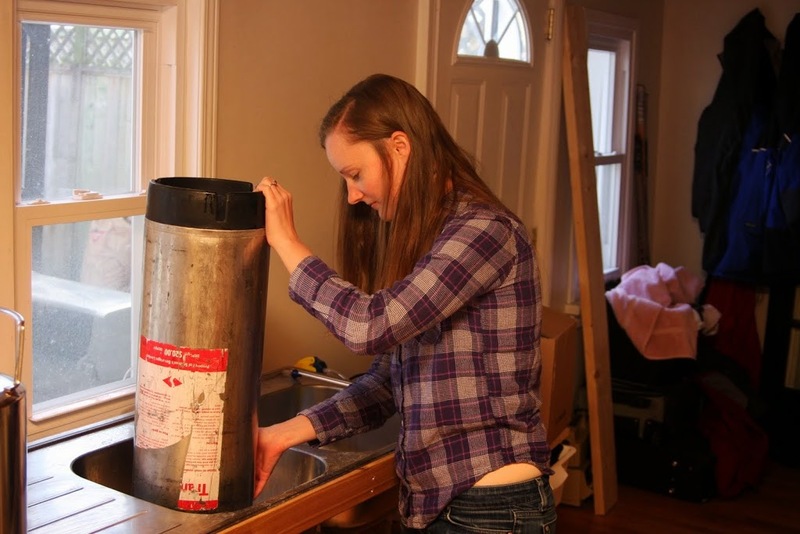 At 29 years old, Shannon is already an accomplished chemist-baker-cook — or to put it plainly, a home brewer. In an industry overwhelmingly dominated by men, Shannon is asserting herself as a talented up-and-comer, focusing on all-grain, small batch home brewing techniques to make interesting and consistent beer. There has been an explosion in craft beer popularity, and brewing it in particular. But for some reason, women appear to less active in the trend. Contrary to marketing attempts like those of Budweiser (where women only ever appear to serve the beer) they are a rising demographic. Shannon has been at the forefront of exposing new beer drinkers to the wonders of home brewing and craft beer in general, leaving many of friends who try her beers wondering why they never liked beer before. Still, it was more than just stereotypes and social standards that Shannon had to overcome as a home brewer. Of course, thanks to a bit of creative ingenuity Shannon has employed technology to help her overcome this brewing obstacle. “So I’ve had to find different ways of going about it. So I have this pulley and ratchet thing that cost about 5 bucks, and now I’m able to do it,” she explains. In addition, Shannon feels she is lucky to have a supportive partner in her home brewing endeavors. While some partners may take issue with the mess, smells and clutter inherent in home brewing, Shannon’s fiance is all to please to pitch in with some of the labour — and undoubtedly enjoys its fruits too. For women — or more accurately, anyone — who wants to pursue brewing, Shannon advocates for speaking with an actual brewer, and visiting them during a brew day. Seeing how exciting the recipe process is, and the planning stages are a great way to get inspired. Shannon also reminds those interested not to get intimidated by the task of brewing. While she uses all-grain techniques and gets quite experimental with her yeast, Shannon notes using malt-syrups from your local craft beer shop can create a wonderful beverage as well. Soon, Shannon plans on turning her hobby into a career. While details are still fuzzy, she has plans to open up a Nano-brewery in the near future, with a focus on community-driven beer sales and collaboration. In the mean time, she recommends 5 Paddles Brewing Co. from Whitby for a good drink — if you can find a beer of theirs. According to Shannon, their small production and high demand often leave for slim pickings at the brewery. Hopefully with a rise in craft beer and a better selection to choose from, women will take up brewing in far greater numbers. The more brewers brewing, the more brews brewed — and the more there is to drink. I can’t wait to see what Shannon and other entrepreneurial women come up with the rest of us beer drinkers can sip it slow.